Science and spirituality both moved together in this land. Science says 'What is this?' while Spirituality deals with 'Who am I? ', knowing who am I. The subjective knowledge about one's self is spirituality and the objective knowledge and objective analysis is science. They are not contradictory, they complement each other.They are the two sides of the same coin. The world is broadly composed of 5 elements: water, air, earth, fire and space. Different objects and things are formed by their permutations and combinations. Spirit is that which holds all these elements together. Studying the 5 elements is what science is. On the other hand, spirituality deals with the understanding of the spirit. Our body is made up of amino acids, carbohydrates, proteins and sugars. Yet the consciousness, our mind - what is the mind made up of? What is the source of thought made up of? What is our spirit made up of? What is the consciousness made of? It is said by many masters that it cannot be understood, but experienced.Yoga and meditation are the means for it. 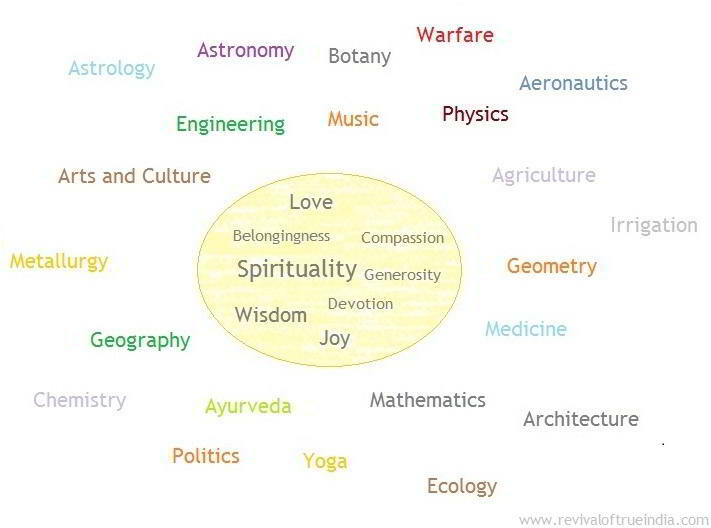 In India, spirituality was at the centre of all other studies. 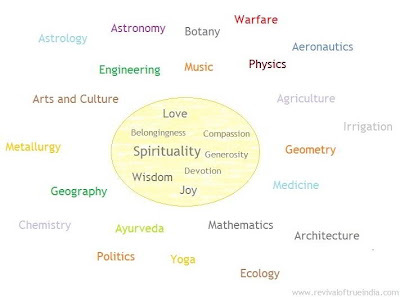 Every field of study revolved around spirituality. Spiritual knowledge was given prime importance along with the scientific knowledge. In fact the ancient Rishis were the scientists of that time. The discoveries and inventions which they have made makes one wonder 'How did they know it!'. A student was given holistic education in science as well as spirituality. However today, education has become a rat race devoid of spirituality. The core values of life- love, belongingness, joy, happiness, generosity - have taken a back seat and lives have become filled with anxieties, inhibitions, fear, stress, hatred, violence. People have forgotten their roots. Life has become materialistic. The juice of life seems to be lost somewhere. Joy and happiness are replaced by short term pleasures followed by sorrow and distress. Now the time has come to make people aware of their glorious past which somehow has been lost in time. Reawakening the national feeling of pride and self-respect is the need of the time.